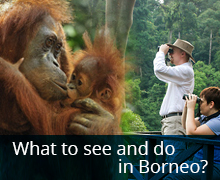 North Borneo is essentially Sabah where it has the most amazing attractions to offer. In this 6D5N programme, we will take in the majestic Kinabalu Park and then travel to Sukau, where you can possibly spot wildlife like the Proboscis monkeys and the pygmy elephants. Lastly, the trip ends at Danum Valley – a wonderful setting to experience the lowland dipterocarp forest. Arrive Kota Kinabalu by flight MH 2614 (1255/1530). Meet & transfer to Hotel. Note: Accommodation at Sukau Lodge is simple yet comfortable with modern amenities in room with electric fan & modern toilet facilities. Guided jungle activities – trek to the Kadazandusun burial site – Coffin Cliff then proceed with trekking to the View Point for a bird’s eye view of the Danum Valley and the Borneo lowland rainforest. Descend to the Jacuzzi Pool for a refreshing dip. Optional: Water tubing for an hour in the Danum River or Trekking along the Segama River. In the evening, if weather permits, enjoy a Night Walk around the lodge in search of nocturnal animals. Recommended Personal GearInsect Repellent, Raincoat, Good Walking Shoes, Sun Screen (sweat proof), Sun Hat, Binocular, Torchlight, Swim Wear, Tevas (sandals), Personal Toiletries and Extra Light Cotton Clothing. Remarks : This tour can be extended to Sipadan for Scuba Diving or just snorkeling & swimming.. Another option is add on a trip to Tabin Wildlife Reserve – 2D1N or 3D2N . Tabin has good opportunity for biard watching and wilidlife sighting.